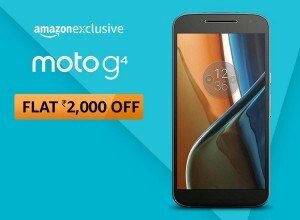 Yes, you are eligible for the flat 2000 discount for moto g4, 1000 discount for moto g4 plus and 500 discount for moto g4 play smartphones. Enjoy the Christmas and New Year with Amazon super deal and own your favorite mobile forever. The specifications of moto g4, moto g4 play, and moto g4 plus are given below. Connectivity: wi-fi, 3G, USB OTG, 4G LTE, Bluetooth, accelerometer, ambient light sensor and Gyroscope. Sensors: Fingerprint, accelerometer, proximity, and gyro. Connectivity: Wi-Fi, 3G, USB OTG, 4G LTE and Bluetooth.